Eeva Karhu’s new series Surrounded by consists of layered photographs, characteristic to her style, where she records perceptions of her surroundings inside a predetermined area. The series was photographed on an assortment of small islands situated on the Gulf of Finland during 2017 and 2018. However, they also invoke her experiences from a previous journey, to a larger island, where Eeva Karhu travelled along the borderlands of Iceland, cycling a total of 1800 km and exclusively sleeping in a tent. Each image records the smaller islands in 64 locations, equally divided onto the circumference of a circle, which are all overlaid onto a digital “multiple exposure”. 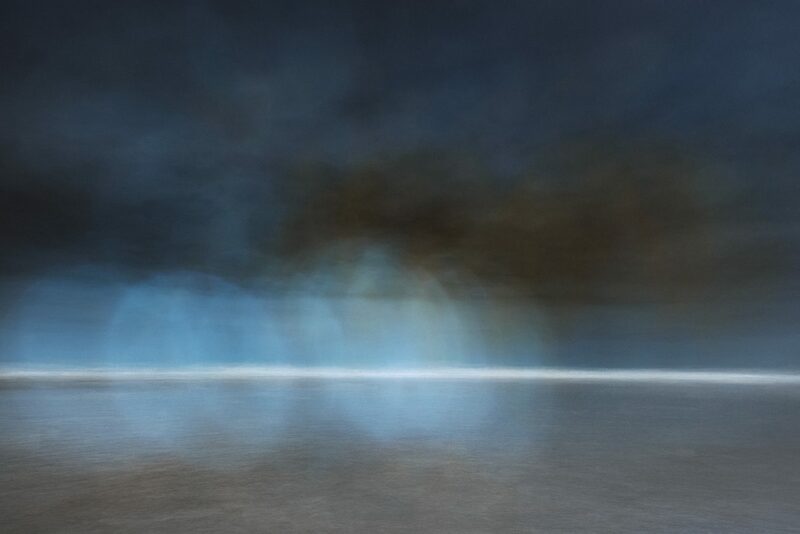 Affectual experiences and powerful memories are transferred onto the images through masks Eeva Karhu places in front of her exposures and sometimes by converting the result into negative form—directly photographed and combined, the composition of the horizon would produce a mainly blueish-grey tone. One of the inspirations for Karhu has been the work of Romantic-era painter William Turner, whose landscapes were created during a time when artists travelled to remote places in order to attain an experience of the sublime in nature. The sublime could possibly be found when nature manifested its destructive powers: for example during a storm or perhaps when confronted by the vastness of the ocean. Similar experiences of the prodigious force and presence of nature, intermixed with capricious weather phases, also influence the images recorded in Eeva Karhu’s memory, and are reinterpreted within her pictures. Concurrently, the process of photographing the subsequent images slowly and alone, on the much calmer smaller islands, has been a very systematic and meditative process. In this manner, her pieces carry several stratified temporalities. In addition to nature, another vital point of departure in Karhu’s work is the investigation of perception and cognition. Unlike a camera, recording everything in its frame with equal importance, the human eye responds to all manner of affect and sensation which colour the experience, mediated by the optic nerves, for each individual. For Eeva Karhu, the compound viewpoints gathered from the perimeter of a circle and merged, work better as a representation of both perceptual experience and the relationship between the self and the surrounding world. Life itself could be evidenced as an experience from a personal “island” and also through various masks as observations melt and merge with memories.